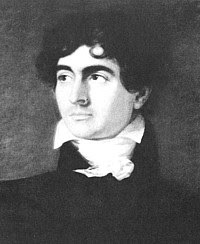 John Polidori (1795-1821) died young, as did so many of his fellow writers of the Romantic Movement (for example, Byron, Keats, and Shelley). Though his degree was in medicine (he was Byron's private physician for a while), he gave English literature one of its most enduring icons -- the vampire. Vampires and revenants had existed in superstition for centuries, but they were part of Eastern European belief. Polidori, inspired by a short piece of fiction by Byron, wrote a story, later dramatized by James Robinson Planche in 1820, which gave us the iconic Western vampire formed after the Gothic type: pallid, imperious, isolated, and charismatic. He was a social and hierarchical creature, far removed from the brutish blood-drinker of folklore. This was the first appearance of the character in English literature, and has influenced literary variations to the present day. Polidori was the son of a Italian emigre'; his sister Frances married Gabriel Rossetti, and so he was uncle to the artistic siblings William, Dante, and Christine. He qualified as a doctor at the very young age of 19, after attending Edinburgh University, and served Lord Byron for a while as his personal physician. In 1816 he accompanied Lord Byron to Lake Geneva in Switzerland. Byron's houseguests Mary Wollstonecraft Godwin and Percy Shelley, as well as Polidori, competed with Byron in a ghost-story contest (the novel Frankenstein owes its existence to this contest). Byron contributed a short vampire tale, which Polidori turned into a longer piece of fiction after he and Byron had parted on extremely bad terms. It mysteriously turned up in an anonymous packet at the offices of The New Monthly Magazine. No name was attached, but Byron was believed by many to be the author. Both Byron and Polidori protested this belief, but whoever the author, the audience knew that Lord Ruthven, the aristocratic revenant, was meant to be Byron himself and this ensured its popular success. Polidori's ambition was to succeed as an imaginative writer in the Romantic style; he wrote one novel, Ernestus Berchtold, and a sacred poem, "The Fall of the Angels." In 1821, disappointed and depressed, he committed suicide at his father's house, at the age of 26. He is remembered at his boyhood school, Ampleforth College, by the Polidori Lecture, given each year on some aspect of the Romantic Movement.